Hida Viloria | Born Both Excerpt in Logo’s NewNowNext! I’m very grateful to the editors at Logo’s new online LGT magazine NewNowNext for running, “What’s Life Like Between Genders? 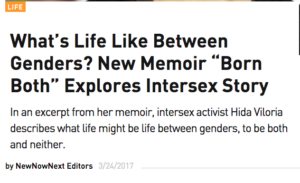 New Memoir “Born Both” Explores Intersex Story,” an excerpt from my memoir Born Both: An Intersex Life. The excerpt covers the moment I decided to change my gender expression, one year after discovering that I’m intersex. Enjoy!